Harold Maxwell '41 is just as proud of Elon today as he was when he played in the college marching band and traveled with the football team. His smile turns devilish when he recalls another fond Elon memory—the dances in Alamance Building. "It was great to see all the beautiful girls so dressed up," he says. "I loved it!" Harold may have hung up his dancing shoes, but his love for Elon remains strong. 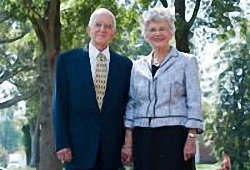 He and his wife, Jolene, chose planned giving as their way to support the university. They established a charitable remainder trust with a farm they inherited many years ago. The gift will support Elon priorities in the future and give the couple tax savings and income for their lives. By giving back, Harold can preserve what he valued most—excellent faculty and a friendly community. "The faculty had a way of inspiring you to do better," he says. "Professor (John W.) Barney gave me an appreciation for literature and drama and encouraged me to read. I also made great friends at Elon who remain my friends today." Harold, a retired dentist, marvels at how his alma mater has grown and hopes his gift will help bring outstanding students to Elon. "I believe everyone deserves the opportunity to go to college, and if I can help make that happen, I think it's worthwhile," he says. "I'm very proud of Elon and the way it has grown and improved. That wouldn't be possible without philanthropy, and Elon needs support to continue to grow."